Something strange happen when I become involved with Egypt, Peru started to call me too. How could a country on the other side of the world have anything to do with Egypt? I’m not the only one that gets called to these two totally different places. There are many things about those two civilizations that are connected such as the megalithic building sites and their many Temples to the Sun. I was excited to add South America to my bucket list and happily headed off to Peru with Amaru Li, a Peruvian Shaman and several of my friends who were with me in Egypt during the Revolution. Funny that this little group would go to Peru together but we were so bonded by our shared experiences in Egypt that it seemed natural, almost necessary, to meet up again on the other side of the world. Just like my Egypt trips, everyday of the trip seemed to be a lifetime. Ollantaytombo, Sacsayhuaman, Caral, Machu Picchu, were some of the most awe-inspiring places I have ever been. I enjoyed the markets and brought home lots of treasures. 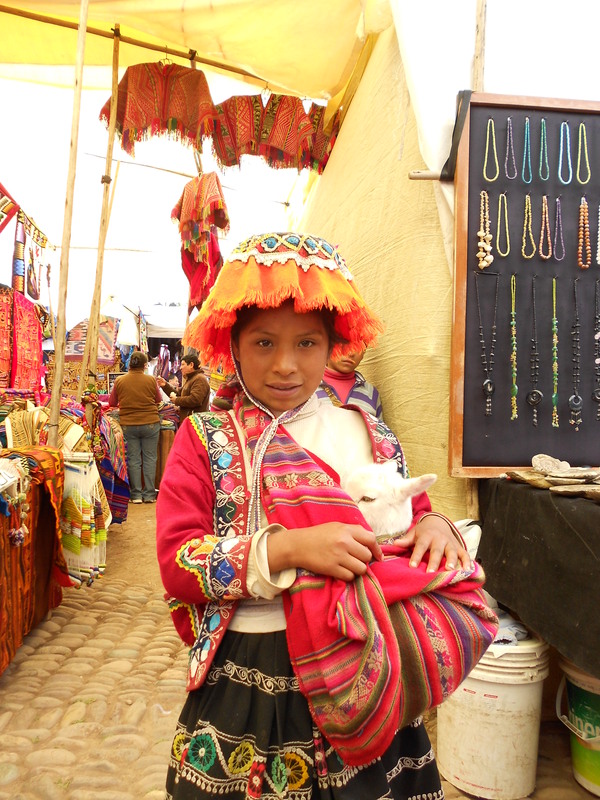 I loved the children in traditional clothes with their baby llamas. I ate wonderful wood-oven pizza and traditional Peruvian food. We stayed in hotels that were better than anything I’m use to in the US. I will always have the special memories of Machu Picchu on the Equinox but it was the seeming ordinary experiences that also enchanted me. On the train to Machu Picchu we made a short stop along side of the river. Out of nowhere a tiny old lady and young mother with a baby tied to her back came up beside the train waving bouquets of flowers for us to enjoy and in return asking for a few coins. We opened the windows and dropped coins to them, a happy exchange for the beauty of those flowers. The evening before going to Machu Picchu we were just ordering our pizza and the electricity went out in the entire valley. The waiter calmly got out candles and the pizza soon arrived. As we walked back up the mountain to our hotel, the quiet and the sparkle of the candles in the restaurants and the intense stars over the ancient mountains was an experience that was magical and romantic. At the hotel desk we were handed candles and headed up to our rooms. No light pollution, no noise from televisions or generators, just the purity of that holy land. Still no electricity in the morning but hot coffee and eggs were waiting thanks to a gas stove. I carried that stillness all day as I explored Machu Picchu, absorbing every rock, plant and llama wandering that sacred mountain. The everyday world receded and only sparkling purity remained. Two days later we were headed back to Cusco after dark. When we got to the highest point on the road and away from light pollution we stopped to see the stars. Being below the equator, this was a sky we were not familiar with. The Milky Way was a sparkling river through the sky and thanks to an Iphone app we could identify some of the most prominent stars in an ocean of stars on the thick dark velvet sky. The extraordinary was mixed up with the ordinary and the ordinary combined with the extraordinary, making everything at every moment sacred. 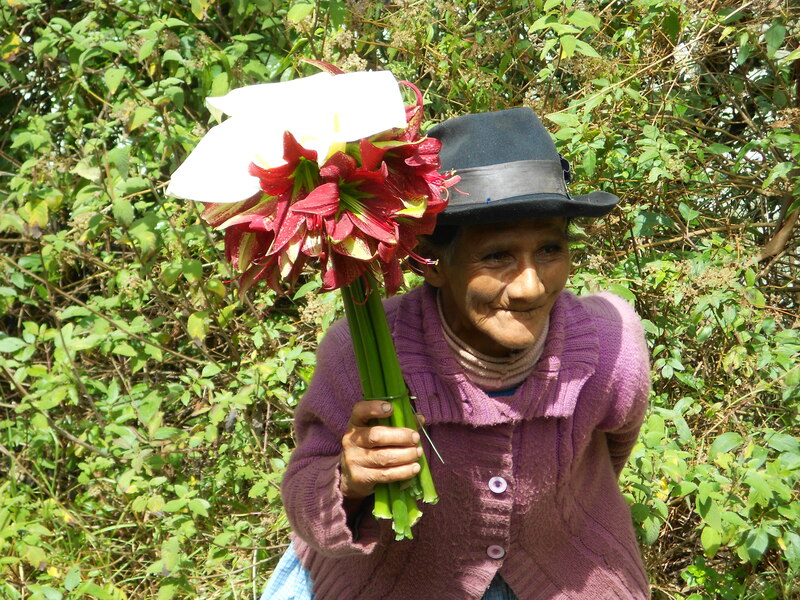 This entry was posted in Flowers, Journeys, Peru by theperpetualpilgrim. Bookmark the permalink.